07/2010: The state sold the house to a private owner around 2000 with an agreement that the new owner must rehabilitate and live in the house. The new owner did this and still lives in the house. For many years, historians both amateur and professional have speculated about the construction chronology of the John Mason House, on thousand acres in Elsinboro Township. 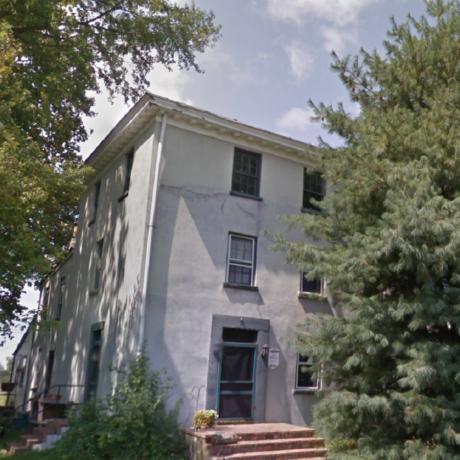 High in the corner of this three-story, stuccoed building, a date stone marked 1695 gave rise to the belief that hidden within the house’s Victorian exterior was the early brick home of one of Salem County’s early settlers. It was not until the dwelling had reached a level of neglect, justifying the removal of interior plaster walls, that new clues about the house’s origins have come to light. Local historian Joseph Sickler suggested in the 1949-second edition of Old Houses of Salem County that “probably the oldest portion is the middle section, as the low ceiling and thick, heavy walls attest. Any glazed brick is hidden beneath the gray stucco of the house’s covering.” Mr. Sickler’s information was partially correct. Although it does not appear that the earliest portion was the “middle” section to the rear, a patterned brick wall has recently been revealed within the existing structure. The state of New Jersey, Green Acres Program, purchased the farm for open-space preservation in 1995. Representatives from the New Jersey Historic Preservation Office, Preservation Salem, Inc., and the National Park Service examined the house in 1996 and removed enough stucco on the exterior of the south wall to reveal the distinct “ghost – line”; of a former gable, now incorporated within the main block of the house. At the same time, closer inspection of the basement walls led to additional speculation regarding the house’s alterations and evolution to its current architectural style.